Home Biafra featured DID JUBRIL UNDERGO PLASTIC SURGERY TO BECOME BUHARI OR WHAT? This is weird but that is what I now think; the people of Biafra who are victims of Buhari’s regime atrocities have constantly claimed that the man in Aso Rock is no longer Buhari but Jubril from Sudan. This claim has not left the doors of the claimants as Nigerians and its friends at large refused to give attention to that. 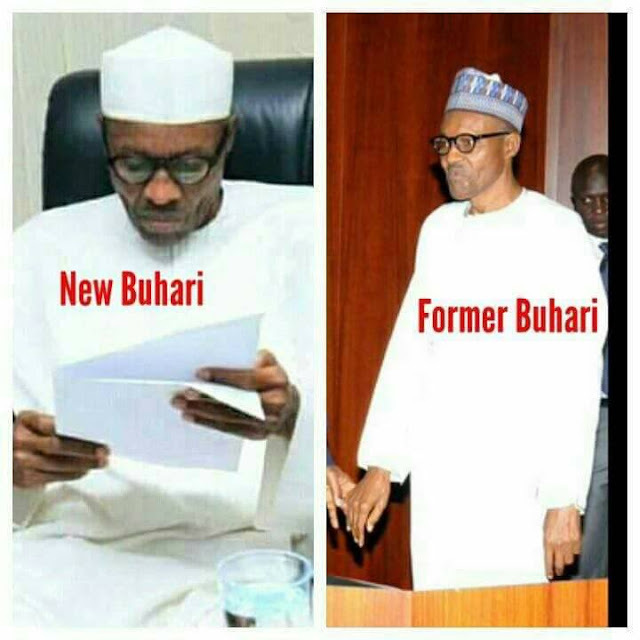 Some said that the people of Biafra are obsessed with Buhari’s death but when he didn’t die; they came up with the claim that Jubril underwent plastic surgery to become Buhari. I did not get involved but have keenly been following events; I often love to have enough ingredients before delving into anything. When I began to believe that Jubril from Sudan is ruling Nigeria; certain things moved me but before that, I want to share my further research with you. I took to Google if plastic surgery can be identified and I got a clear response that plastic surgery cannot be identified unless within those who knew there was really a surgery. Plastic surgery takes months to heal properly and cannot have issues hence it was duly healed. We are in a situation one cannot provide substantial evidence against Jubril (Buhari) because surgeons have made it clear that one who had a plastic surgery cannot be identified; more especially when he didn’t rush his healing. Going further; the claim can only be vindicated by character study of the Buhari before three months medical trip and the Buhari after the trip. Buhari had meetings with world leaders and other international friends; local personalities and governors but that is not enough proof to discard the claim of plastic surgery, like I said above, carefully performed plastic surgery can go unnoticed for as long as one didn’t confess to it. I am not authoritatively saying that Jubril from Sudan had a plastic surgery to look like Buhari and ruling Nigeria; rather, my simple message is that the claim is gaining momentum. I will further state what gives the claim momentum. It took Muhammadu Buhari three months to come back from London after his first medical trip that left him billowing in the wind. Three months is quite enough for surgical healing but it would be bias or unproven saying that Jubril did take three months for surgery. So many things make me think weird; Muhammadu Buhari per-say has suddenly changed since his return. I will outline my points and leave you to judge. Muhammadu Buhari (Jubril) suddenly came back and all his infirmities disappeared; no more billowing in the wind, no more working from the office, no more health issues even as we suspected his case is incurable owing to the fact that the presidency refused or is afraid to disclose to the people the health status of the man. Surprise, surprise the weak man was made strong not by miracle nor gradual healing but magic. But let us believe that Muhammed Buhari was healed by God, courtesy of the prayers of Nigerians, then what about his coyness or shyness? Recently; Ibe Kachikwu was unable to meet the president face to face after a monumental NNPC scandal. The president has refused to use his office; probably to avoid the public and being met unprepared. The senate president and speaker have both been embarrassed when they tried to gain entrance into the Villa for a dinner with Muhammadu Buhari. Hours after; Muhammadu Buhari issued a statement that he would meet them but that was not fulfilled as they stormed out of Aso Rock annoyed. Reports have it that his government is being managed in his absence and like someone that doesn’t know anything going on in his government. Meanwhile; the president has only allowed meetings’ with strangers that have not frequently met him before and this speaks volume of the plastic surgery which according to research cannot be noticed by distanced friends or people. Strategically; Muhammed Buhari (Jubril) has only allowed meetings’ with people who are not closer before and come to the public only when he is prepared. The president has never allowed a meeting without sufficient preparation and has distanced himself from emergency things. Many have said that the president is trying to minimize his workload but in many cases; we have seen a president that is no longer complaining of ill health and weakness, then what again is he hiding and why is his office still vacant and operating from home? Since the issue of Muhammadu Buhari’s three months medical trip and healing; the system has virtually collapsed. The ministers and kitchen cabinets seem to have gained immunity; everybody behaving the way they want because they have leverage over the government. I would not make a case and also be the judge; it is left for the people to think and conclude if the ministers or cabals are doing what they are doing because they know that the real president is no more. SGF was sacked and he boldly asked who the presidency is? This further indicates that decision making is not definite but agreement of cabals that fixed Jubril (Buhari). Hitherto; we have not been able to ascertain who signed 26billion dollars NNPC contract; we are not aware of who reinstated Maina, we are not aware of Lawal scandal because he is not under probe and his cousin only took over. If I continue to mention all of the scandals without the president’s ability to make a difference; it would make a new topic. Unlike Buhari; Nigeria is simply operating without a commander in chief or rather the commander in chief has been charmed and controlled or doesn’t know what is going on anymore in the government. If Muhammadu Buhari is really Muhammdu Buhari and things are helplessly deteriorating by each dawn; then something is cooking behind us. Nigerian military has shown a glimpse of this vacancy; Jubril (Buhari) from Sudan who is entirely or unable to learn quickly has not been able to settle which ultimately placed responsibilities on the head of institutions. A columnist had a deep thought over the actions of the military and posited that the military could be preparing for a coup d’état. His thought came after accessing the independence of the military in execution and advertisement like an independent body. He further suggested that the military has no power and should always be under command and control of the state. Citing his example; he brought immunization without the consent of states and minister of health into the picture. Before Maina’s scandal; he was captured in a picture with Muhammed Buhari (Jubril) but which was subsequently denied by the presidency. The disconnect gives momentum to the claim of plastic surgery because the man in Aso Rock behaves strange and seems not to be aware of anything going on in the government. something to prove me wrong. Forward a convincing counter and I will retract.